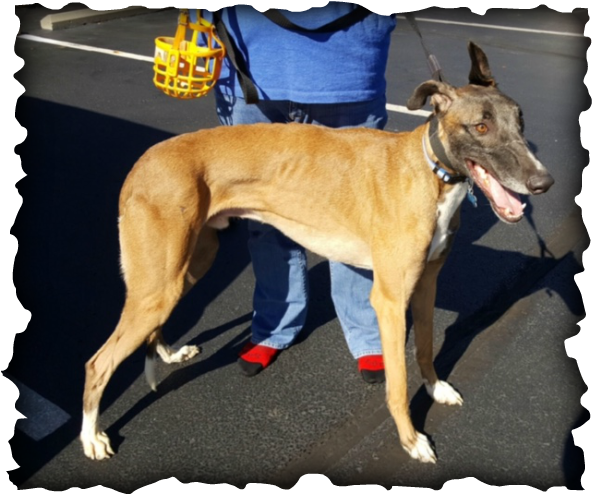 He was in a home with several greyhounds and two cats that were very active, he just couldn't handle that stimulation So he is looking for a new home. He never finished race school training because he couldn't fit in the starting box! VERY tall gorgeous boy! FOSTER DAD says: Rooney is adjusting well with my 3 other dogs, likes to play, but also calm, he is a little pushy because of his size. He tends to be stubborn and needs a strong human for corrections. He is very affectionate and loves all the attention. Walks well but curious and strong.